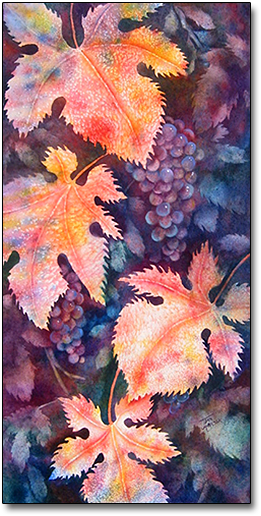 The focus of this watercolor and Gouache painting is a grapevine in autumn. The grape leaves have drunk in the sun and nutrients during the spring and summer months of the growing season. They are at their peak and "Ready for Harvest," and the leaves are going out in a blaze of glory. This painting is available for purchase. It is custom framed with a gold leaf moulding and linen liner. When you make your selection, click on the Add to Cart button to finish your purchase. Free shipping for this original painting.